Penne Pasta Recipe with Campagnola Sauce – This Sauce is Top! Treat your family and friends to this flavorful end-of-summer penne pasta recipe. What could be better than harvesting fresh produce from the garden and turning it into a delicious meal in the same day? 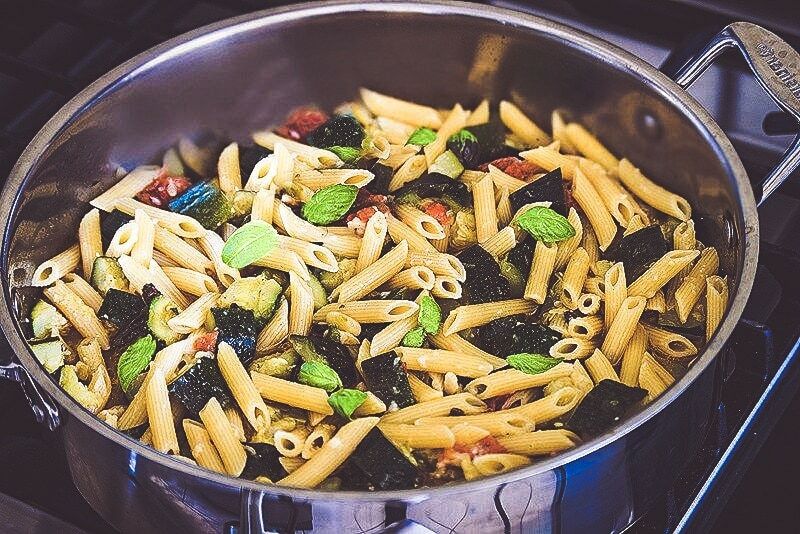 Penne pasta recipe with Campagnola sauce is colorful and full of wonderful flavor and textures. Use the best, freshest ingredients possible–in addition to produce from your garden (or a local farm), I recommend using pinot grigio for the white wine in the sauce. With three main ingredients and a 30-minute cook time, this could possibly be one of the quickest and simplest recipes ever. 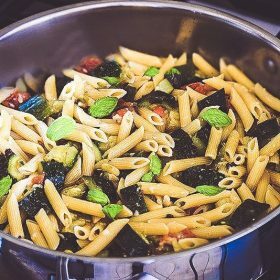 Penne pasta recipe with Campagnola sauce (Penne alla Campagnola) is a Roman pasta recipe that uses the abundance of zucchini that is harvested during the summer months. If you harvest zucchini then make sure to try out our fried zucchini blossoms recipe. In a short time, you can have a deliciously full and healthy meal on the table for your family that will taste like the freshness of the end of summer. I hope you are having a relaxing, enjoyable, and delicious summer. This penne pasta recipe with Campagnola sauce is a fresh recipe for your summer. This particular sauce is delicious! In a large skillet over medium heat, add the olive oil and sauté the garlic until fragrant. Add the zucchini and stir, then add salt and pepper and cook for 3 minutes. Add the wine, stir, and cook until the wine evaporates. Stir in the chopped tomato. Add water and basil. Cover, turn heat to low, and cook for 20 minutes or until zucchini is tender. Turn the heat off, add the Parmigiano-Reggiano, and stir to incorporate. Set aside. In a large pot, bring 4 quarts of salted water to a boil. Add the pasta and cook for 8 minutes, stirring occasionally. Drain and transfer to the skillet with the zucchini. Turn the heat back on and stir to incorporate. Sauté for an additional 3 minutes.